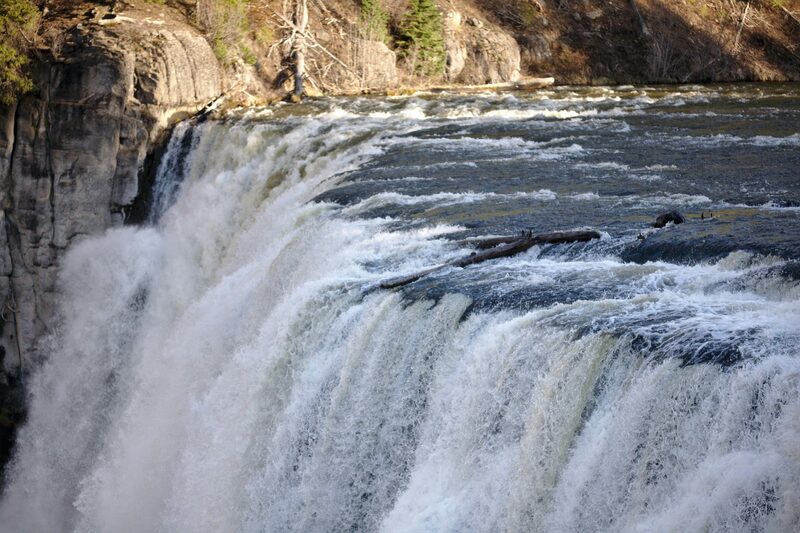 Beginning in gently rolling farmlands, dipping into a tumultuous river confluence, and traveling over the rim of the nation’s largest volcanic caldera, Mesa Falls Scenic Byway takes you through some of southeastern Idaho’s most compelling scenery. In addition to enjoying breathtaking vistas along the route, devotees of intermountain recreation find countless activities to indulge their passions on the route’s 27 miles. Originally a popular path to Yellowstone National Park, the byway offers plenty of reasons to justify a trip in itself. Your journey begins in the rural town of Ashton. Stop in at one of the restaurants for small-town hospitality and stay the night at a local inn. As you embark on the Mesa Falls Scenic Byway, the first nine miles or so travel through the town’s surrounding potato, barley, and wheat fields. The gently rolling terrain stretches for miles in all directions as the Grand Teton Mountain Range looms in the distance. Soon the fields give way to Targhee National Forest and the route descends into the Three Rivers Canyon. Created by the convergence of Warm River, Robinson Creek, and Henry’s Fork, the gorge brims with ponderosa pine, popular fishing spots, and campsites. Continue along the route to climb up to the nation’s largest volcanic caldera. Pull over and walk among stands of Douglas fir and aspen. Admire the view of grassy meadows scattered throughout dense pine forests before getting back into the car and following the route to the caldera’s floor. Mesa Falls Scenic Byway travels along Henry’s Fork of the Snake River. Under consideration for designation as a wild and scenic river, Henry’s Fork offers a variety of recreational activities like fishing, whitewater rafting, and waterfall viewing. Stand nearby and enjoy the cool mist rising from Upper Mesa Falls, the last undisturbed waterfall in the Columbia River System and take a couple of the side trips to other falls in the region. Don’t have the gear or expertise to handle the rapids or want an insider’s knowledge of the good fishing spots? Check out the listings for local outfitters and guides and create some memories. Much of the byway lies within the Greater Yellowstone Ecosystem, home to a world-famous variety of charismatic wildlife. As you approach the northern end of the byway, you’ll enter Osborne Meadows, a haven for moose, deer and elk. This large meadow attracts the kinds of animals that make Yellowstone famous without pulling in the same kinds of crowds. During wintertime the vast open area attracts snowmobile riders and cross-country skiers as a gateway to the National Park or a destination in itself. With a multitude of outdoor recreation opportunities, ecosystems and scenic views, Mesa Falls Scenic Byway provides the perfect glimpse of southeast Idaho. You will pass by the lodge on the walk to the upper falls. In 1997, work began on the rehabilitation of Big Falls Inn. This pictures show the lodge as it was before reconstruction. Above is the completed Big Falls Inn. The Grand Opening was held on July 14, 2001. Big Falls Inn is open 7 days a week in the summer months, and is an interpretive center and book store.